Cost to apply plaster varies greatly by region (and even by zip code). Get free estimates from plastering, stucco and molding contractors in your city. Cost to apply plaster varies greatly by region (and even by zip code). Get free estimates from plastering, stucco and molding contractors in your city. How much does it cost to apply plaster? Plaster is one of the most common forms of home interior finishing and decor, often used to create a smooth, plain surface for walls, windows, and doors surrounds. The quotes for plastering are normally based on the area to be covered, other words, the cost per square foot increases with height of the wall and how difficult it is to access. Difficult to reach areas cost a lot more; as much as 50% above the normal rates. Before you can start plastering, the surface where the plaster will be applied needs to be prepped, which is an additional amount. The cost of plastering prep work can vary due to the condition the surface being plastered is in. Prep work includes sanding textured surfaces, moving furniture in rooms, filling holes in wall, masking crown molding and switches and/or sockets with tape, and the application of drywall mud and primer. The cost of plastering prep work ranges from $1-$3 per sq.ft. and normally increases project costs by 10% to 30%. However, for resurfacing, extra tasks are involved and they range from removing old plaster 1, which costs $2-$3 per sq.ft., to repairing cracks and holes, and tearing down and restructuring whole wall parts. The cost of resurfacing depends on the extent of the prep work and is usually above $10 per sq.ft. while new plastering averages around $2-$10 per sq.ft. 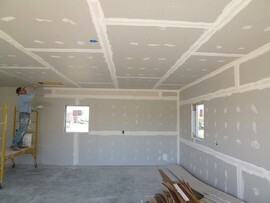 New plastering takes more time to accomplish $2-$10 per sq ft.
Plastering costs vary depending on the materials used. Drywall 3 comes mostly in gypsum, pre-built panels that are used to line the walls of homes and costs an average $2-$5 per sq.ft. 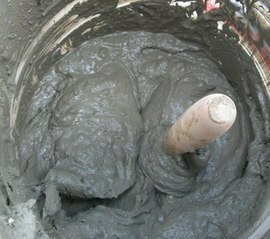 On the other hand, wet plaster 1 mostly consists of lime and cement mixed with water and sand to a standard consistency and costs on average $5-$10 per sq.ft. Plaster 1 of Paris (calcined gypsum), when mixed with water can be used to stylize and mold shapes to decorate homes in many styles. POP costs start around $3 per sq.ft. and up depending on the decoration. Applying plaster 1 is done by professional plasterers and is not a job that can be undertaken DIY. A plasterer 1 will begin by taping all the joints in the drywall 3, then giving them a skim coat of plaster 1 to create a flush surface to work from. Plaster 1 dries quickly, so a plasterer will work fast to trowel the plaster 1 onto the walls in smooth, even strokes. A wall will cure within 1 hour, so during this time, the plaster 1 will be applied, cut into the edges, and smoothed out to a flat, even finish with no blemishes. Most plasterers charge by the square foot, at a rate of between $2 and $10 a sq. ft. Necessary precautions need to be taken when clearing the waste from plaster 1 or lath that has been removed. Homeowners can do this on their own to cut project costs, but professionals are recommended, particularly when toxic compounds like asbestos 4 aggregates are present in the plaster 1 or if the plaster 1 has been coated with lead paint. Professional services for cleaning can cost an average 3-5% of total project cost. To avoid the spread of dust to other rooms, sheeting with plastic boards should be used to cover openings, while any debris should be sprayed with water to prevent dust from rising. Extra costs for plastering may come from finish work. 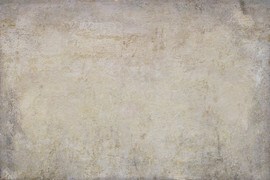 Plastered surfaces can be finished in various textures and styles, such as dash, lace, two-tone, and fine sand. Finishing costs range between $1 and $3 per square foot. You may want to paint your plastered walls or casing once they are dry. Painters charge around $20-$35 per hour and one painter can take 1-2 hours to paint a 100 sq.ft. wall at a total cost of $20-$70. The location of the area you are having plastered may affect its cost. Interior walls are usually less expensive than external areas, as workers don’t have to struggle with issues like unpredictable weather. Outdoor plastering can cost around 5 to 8% more than indoor plastering for this reason. Plastering high walls involves extra labor, including the installation of scaffolding 5, while the rate of work is slower, which can result in a quote or cost higher than work on low level surfaces. 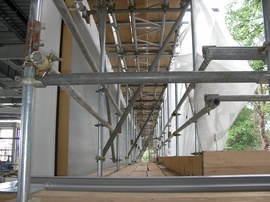 The cost of plastering areas requiring scaffolding 5 can be up to 20% higher than for lower areas. Additional costs for removing old and unwanted plaster 1 is normally included in the project. However, if it is not, the cost averages $2-$3 per sq.ft. When plastering unfinished rooms, the final surface needs to be finished. An extra 10% labor cost should be added for the extra time in unfinished rooms. When plastering a room already in use, extra costs can be also expected, especially if the room is filled with furniture or other objects that the plasterer needs to move around. However, the owner can reduce this cost by moving objects himself/herself, or pay an additional 2%-5% in labor costs for it. How much does it cost to apply plaster in my city? Cost to apply plaster varies greatly by region (and even by zip code). To get free estimates from local contractors, please indicate yours.